Why didn’t Napoleon escape to the United States? After his 1815 abdication from the French throne, Napoleon Bonaparte wanted to start a new life in the United States. Why didn’t he? 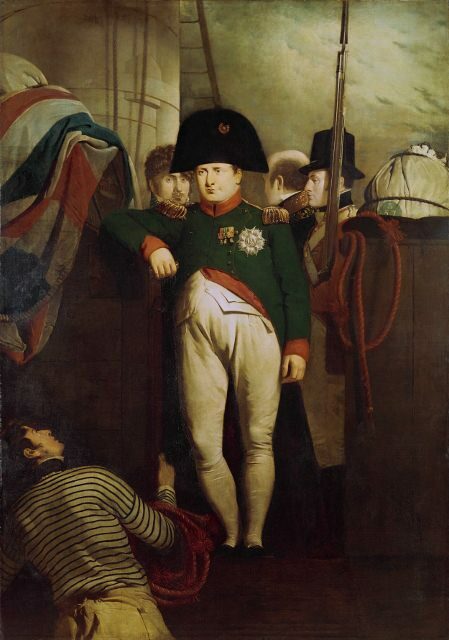 After losing the Battle of Waterloo on June 18, 1815, Napoleon returned to Paris with the aim of shoring up his domestic support before continuing the war. When he arrived on June 21, the Chamber of Deputies and the Chamber of Peers called for his abdication. (See Lucien Bonaparte’s remarks to the Deputies and the Marquis de Lafayette’s response.) On June 22, Napoleon relinquished the throne in favour of his son, Napoleon II, whom the provisional government soon deposed. Napoleon knew he was in danger. If captured by the coalition, he would face either imprisonment (favoured by the British) or death (Prussian Field Marshal von Blücher’s preferred way of dealing with him). That evening Napoleon asked naval minister Denis Decrès to place two French frigates at Rochefort at his disposal. Decrès said he would be happy to do so, as soon as he received orders from the provisional government, which was led by Napoleon’s former police minister, Joseph Fouché. Unbeknownst to Napoleon, Fouché wanted to use him as a bargaining chip in negotiations with the coalition. That same day Napoleon sent General Henri Bertrand to renew the request for the frigates, and to apply to Fouché for passports that would enable him to go to the United States. Meanwhile the provisional government directed Napoleon to proceed to the frigates and wait in Rochefort for the passports. Napoleon offered to stay and fight the coalition, but Fouché ignored the offer. On June 29, with the Prussians about to pounce, Napoleon left for Rochefort. According to Savary, he was still under the impression that passports would be forthcoming. One of the frigates could occupy the British while Napoleon escaped on the other. Napoleon could slip out on a corvette called the Bayadère, which was anchored at the mouth of the Gironde estuary, south of Rochefort. Though Captain Charles Baudin was pleased to put his vessel at Napoleon’s service, he noted that it was not particularly fast. Instead, he recommended two American ships, the Pike and the Ludlow, also at the mouth of the Gironde. Baudin was confident he could get Napoleon to the United States, as long as he came on board soon and secretly, with only two or three companions and the least amount of baggage possible. Napoleon approved of this plan. He also considered slipping through the blockade on a Danish brig, called the Magdeleine, commanded by a Frenchman named Besson. Count de Las Cases was authorized to put 25,000 francs at Besson’s disposal to provide the necessaries for the voyage. But Napoleon failed to depart. Though people in his entourage, as well as the provisional government, urged him to leave, Napoleon gave excuses. These ranged from wanting to wait for the passports, to reluctance to board a foreign vessel, to not wanting to abandon the majority of his companions (over 60 people had come with him to Rochefort). As Napoleon dithered, the number of ships in the British blockade grew. On July 8, with the provisional government ordering him to go (his continued presence in France made peace negotiations difficult), Napoleon boarded the Saale and proceeded to Île-d’Aix. On July 10, Savary and Count de Las Cases met with Captain Frederick Maitland, commander of the British frigate Bellerophon. They gave him a letter from General Bertrand. I cannot say what the intentions of my Government may be; but, the two countries being at present in a state of war, it is impossible for me to permit any ship of war to put to sea from the port of Rochefort. On July 12, newspapers arrived from Paris announcing the return of Louis XVIII to the throne. Rochefort would soon be under royalist orders. 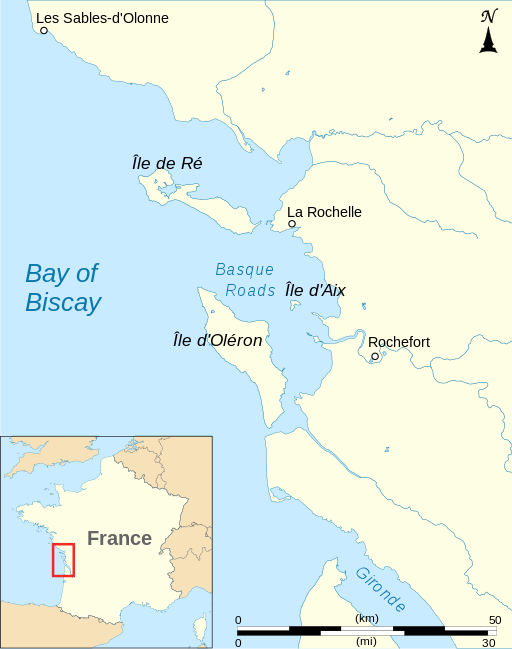 On July 13, Napoleon’s brother Joseph joined Napoleon on Île-d’Aix. He offered to stay and disguise himself as Napoleon while the latter escaped to the United States. Some young French naval officers offered to form the crew of a small sailing ship (a chasse-marée), and try to slip through the British cruisers. Napoleon seemed to trust them, and a few of his personal effects were carried on board. [The Emperor] had given me orders to put all the arms in good condition; they consisted of several pairs of pistols and four fowling pieces, one double with a revolving breech. The sailors of the ship came to get them and the ammunition for them in the evening. They also carried away things for the Emperor’s use, and linen, clothes, etc., for the needs of the voyage. These sailors, who were three in number, were accompanied by M. Besson. On July 14, Napoleon sent Lallemand and Las Cases to the Bellerophon to find out from Maitland what might lay in store for him if he went to England. He had already drafted his letter to Britain’s Prince Regent, throwing himself under the protection of British laws (see my post on All Things Georgian). Maitland said Napoleon would receive all the attention and respect to which he could lay claim in England, but noted he was expressing only his personal opinion, having received no instructions on the subject. On the return of Count Las Cases, the Emperor hesitated long as to the course which he ought to pursue, and I have reason to believe that he would have gone secretly on board the Bayadère … had not private interests exercised a powerful influence in restraining him from a course which would have necessarily excluded a considerable number of us from having the honour of accompanying him, and delivered us up to the enmity and malice of the royal administration, which was already in action in Rochefort. On the night of July 14, Louis XVIII’s orders for Napoleon’s arrest reached Rochefort. On July 15, Napoleon boarded the Bellerophon, which took him to Plymouth Harbour. On July 31, Napoleon learned he was going to be exiled to St. Helena. He was transferred to the Northumberland, which set sail for his island prison on August 8. Could Napoleon have escaped from St. Helena? What if Napoleon won the Battle of Waterloo? How did Napoleon escape from Elba? Antoine Marie Chamans Lavalette, Memoirs of Count Lavalette (London, 1895), pp. 327-328. Guillaume Joseph Roux Peyrusse, 1809-1815: Mémorial et archives de M. Le Baron Peyrusse (Carcassonne, 1869), p. 317. Anne Jean Marie René Savary, Memoirs Illustrative of the History of the Emperor Napoleon, Vol. IV, Part 2 (London, 1835), p. 115. John Gurwood, ed., The Dispatches of Field Marshal The Duke of Wellington, During his Various Campaigns in India, Denmark, Portugal, Spain, the Low Countries, and France, from 1799 to 1818, Vol. 12 (London, 1838), p. 515. Memoirs Illustrative of the History of the Emperor Napoleon, Vol. IV, Part 2, p. 140. Gaspard Gourgaud, Talks of Napoleon at St. Helena, translated by Elizabeth Wormeley Latimer, 2nd edition (Chicago, 1904), p. 12. Revue des Deux Mondes, Vol. 73 (Paris, 1886), p. 761. Louis Adolphe Thiers, History of the Consulate and the Empire of France Under Napoleon, Vol. XII (Philadelphia, 1894), p. 294. Frederick Lewis Maitland, The Surrender of Napoleon (Edinburgh and London, 1904), pp. 27-28. Charles de Montholon, History of the Captivity of Napoleon at St. Helena, Vol. I (New York and Philadelphia, 1846), p. 34. Louis-Joseph Marchand (Proctor Jones, ed. ), In Napoleon’s Shadow (San Francisco, 1998), p. 282. Talks of Napoleon at St. Helena, pp. 16-17. Louis Étienne Saint-Denis, Napoleon from the Tuileries to St. Helena, translated by Frank Hunter Potter (New York and London, 1922), pp. 153-154. History of the Captivity of Napoleon at St. Helena, pp. 34-35. In Napoleon’s Shadow, pp. 283-284. 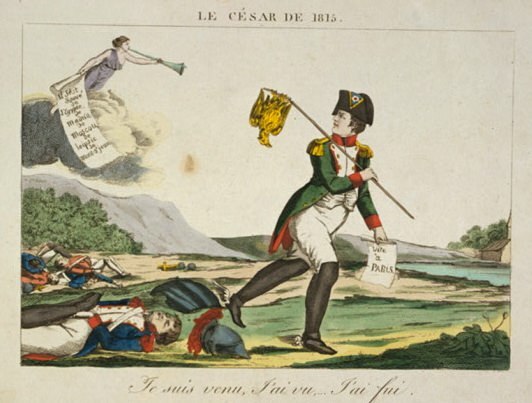 The Surrender of Napoleon, pp. 45-46. Talks of Napoleon at St. Helena, p. 184. Excellent summary. Napoleon after Waterloo: England and the St. Helena decision is an excellent resource also. Michael John Thornton is the author. It is dedicated to the circumstances you mention as well as the time he spent on the Bellerophon. And there is another angle that will be coming forth in the book that I am working on. Thanks Paul. I’ll add Thornton’s book above. Looking forward to learning about your angle. Nice summary. I recommend people interested in more on this topic read my book, The Road to St Helena: Napoleon After Waterloo. Terrific information and so many good sources! Well, all your researches are just respectable and incredible! Also check out “Napoleon and the American Dream” by Ines Murat. 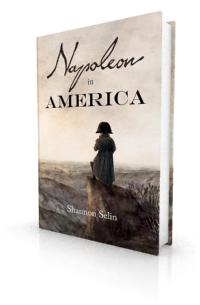 I read it many years ago but the gist of it as I recall was that Napoleon had an idealized image of America and that he fantasized about living the life of an explorer in the American west. 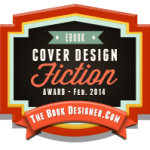 Yes, that’s a good book. Thanks for mentioning it, Dave. It is not without danger to place oneself in the hands of one’s enemies, but it is better to risk trusting their honor than to fall into their hands as a rightful prisoner.